VTT-P6101 Includes in Package - TT Table, TT Net, Net Clamps, and a User Manual. 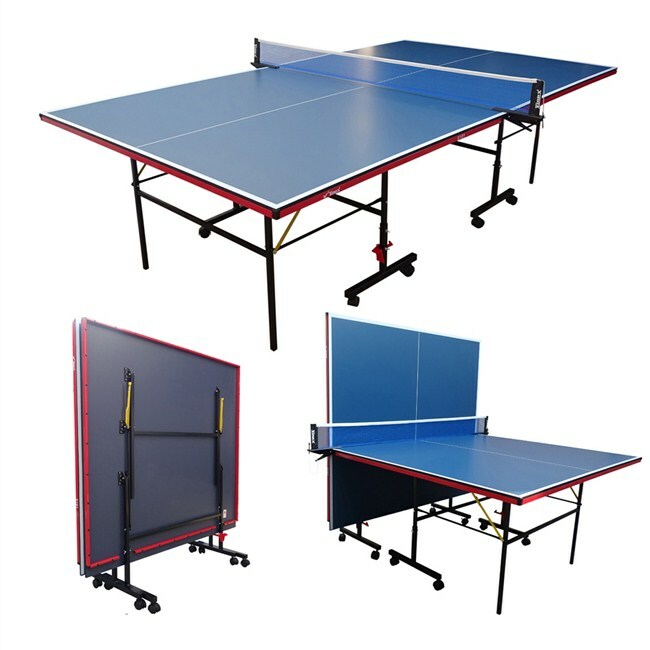 A perfect Indoor TT Table model to enhance your Table Tennis Playing Skills. It is made of 12 MM thick Compressed MDF Board (both sides laminated) that offers smoother playing surface and board's low glare feature prevent players from outer reflection. The table base frame is made of 12 MM x 24 MM rectangular steel tube with rectangular legs to hold the top. It is a foldable and portable model and also supports to Solo Play. This Table Tennis Table comes along with TT Net, Net Clamps, and a User Manual. It is ideal to be used for Beginners, Fun Playing at Home, Sports Clubs and Corporate Offices. Table Weight (Kg. ): 56 Kg. Package Weight (Kg. ): 66 Kg. Includes in Package: TT Table, TT Net, Net Clamps, User Manual. Ideal For: Beginners and for Fun Playing at Home, Sports Clubs and Corporate Offices. Product Warranty: Warranty is limited to manufacturing defect if any and that too is informed within 24 hours after receiving the ordered product.